World demand for nutraceutical ingredients will rise 6.4 percent annually to $28.8 billion in 2017. Brazil, China, India, Mexico and Turkey will be among the fastest growing consumers and producers. Maturing markets and recurring safety controversies will hamper growth in developed regions. Nutrients will remain the top selling group. 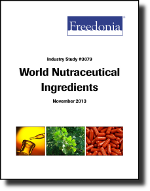 This study analyzes the $21.2 billion world nutraceutical ingredient industry. It presents historical demand data for 2002, 2007 and 2012, and forecasts for 2017 and 2022 by product (e.g., nutrient ingredients, herbal and other extracts, mineral and vitamin ingredients), world region, and for 17 countries. The study also considers market environment factors, details industry structure, evaluates company market share and profiles 38 industry players, including Royal DSM, BASF and DuPont.